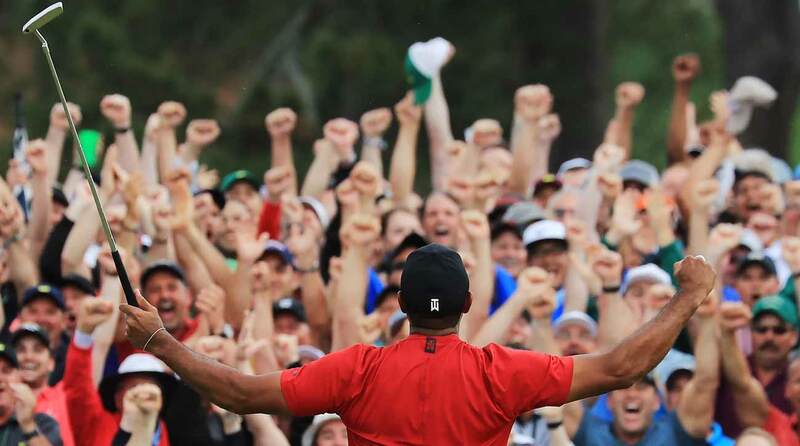 AUGUSTA, Ga. — Tiger Woods was still putting the finishing touches on the most unlikely of his 15 major titles, but inside Augusta National’s clapboard clubhouse, the party had already begun. Justin Thomas’ card was down at the grill-room bar. (“Anyone who wants a drink, just put it on my tab,” he announced.) 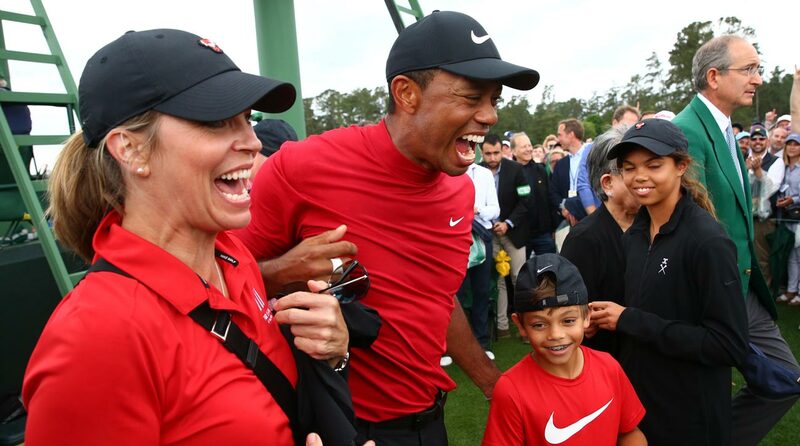 From a corner table, Tiger’s family — his mother, Tida, girlfriend Erica Herman, and two children, Sam and Charlie, all clad head-to-toe in Tiger’s familiar Sunday colors, red and black — took in the closing moments on a TV mounted to the wall. Outside, under gloomy skies, 15 youthful servers in their all-whites stood in a row along a rope line near the old oak, several of them on their tippy toes as they strained for a glimpse of the joyful, raucous scene unfolding on and around the 18th green. All of them were too young to remember Woods’ first Masters win here in 1997, so you could hardly blame them for sneaking out to witness another unlikely piece of history: the resurrection of Tiger Woods, major champion. “Anyone who wants a drink, just put it on my tab,” Justin Thomas announced. The view was much better up on the clubhouse’s second-floor wraparound balcony. From there, you could catch a glimpse of Woods walking off the 18th green and through a channel of thousands of frenzied patrons on his way to the scorer’s cabin and the cadre of players — Rickie, JT, Bubba, Brooks, Bernhard — who were waiting to congratulate them. You could hear the procession before you saw it. “Ti-ger! Ti-ger! Ti-ger!” the galleries boomed. If you didn’t have goosebumps, you didn’t have a pulse. Hyperbole? It didn’t feel like it on Sunday afternoon, as roars and delirium ripped around the property. Here was a guy who hadn’t won a major in 3,954 days, who endured an ego-eviscerating international scandal, whose spine is held together with screws, who less than two years ago said he could envision himself never playing competitive golf again — this guy somehow, some way, won major title No. 15. The king has reclaimed his throne, and now anything seems possible: more wins, more majors, world peace. Everywhere you looked, people were high-fiving, smiling, shaking their heads, hugging. Here came Patrick Reed, rosy-faced and resplendent in his neatly tailored green jacket, walking back toward the clubhouse after twice slipping the green jacket on Woods: once in a private session in Butler Cabin and again on the putting green near the 1st tee. “Honestly, I didn’t know if he could do this,” Reed said. He was grinning and seemed genuinely happy for Woods. “You start messing with the body, you start getting injuries, especially with the back with as much torque as put on it, you don’t know if he’s ever going to come back and be the same. Then you see what he did today. Reed was reflecting on a question about whether Woods’ performance on Sunday would reinstall some of the intimidation factor. Tiger is back is a phrase that many believed would never be uttered again, at least not with any conviction. Now you can holler those three little words from the mountaintops. Here are three more: five green jackets. That’s more than any golfer has won not named Jack Nicklaus. The first came, famously, in 1997. Back then, Nostradamus couldn’t have predicted what the next 22 years would hold for Woods — the soaring highs, the unthinkable lows. Tiger Woods is back—all the way back. And everyone at Augusta National on Sunday knew that. Back in the clubhouse, all eyes were glued to the TVs in various sitting areas. In a room on the ground floor that houses the Masters trophy and several couches, about 20 members, guests and media members huddled quietly around a monitor that was playing the CBS broadcast. As Woods sized up his first putt on 18, someone cracked their knuckles. Nervous laughter. Then silence again. Up the spiral staircase, in the dining space across from the Champions Locker Room, more tension. Woods had two putts from 15 feet for the win, but he wasn’t in yet. Guests seated at round tables with white table clothes anxiously watched the TV in the corner. So, too, did a dozen or so loitering waiters. A man in a green jacket sat at the table closest to the TV sharing a bottle of Bordeaux with his wife. It was the 2016 champion, Danny Willett. Minutes earlier the Englishman and his bride, Nicole, had strolled out on to the balcony, because they wanted to hear for themselves the jubilation emanating from the course. Willett knows a thing or two about coming back from the abyss. After his Masters title, he battled injury, poor form and self-doubt, and didn’t win again for two and a half years. Did Willett believe Woods could prevail on this stage again? On a thrilling Sunday afternoon in April, the world found out what Tiger Woods can be: Tiger Woods again.